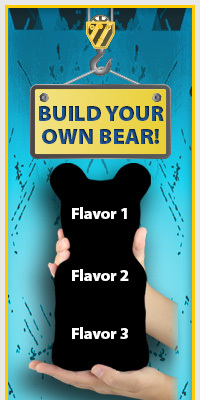 The Big Bear!™ is a handy snack size confection that comes in our most "popular" flavors. This pack of bears includes (2) Cherry, (2) Blue Raspberry, and (2) Sour Apple and weighs approximately ¾ pound. The Big Bear!™ is made in the USA by our fine Master Gummy Craftsmen.